This is a story about the RedCcup, an international freediving competition that was held recently in Dahab, Sinai, Egypt. It’s also the story of my journey to my first freediving Depth Competition. The taxi driver swerved to avoid a rock in the road, kicking up a plume of golden dust behind the car. I braced with one hand on the dash, the other holding my camera as I swiveled around in the front seat, trying to capture a picture of the camel wading in the surf to my right. Camel. In the surf. I was once again reminded how different Egypt was from my Florida home. Accompanied by 4-time World Champion freediver Sara Campbell, our taxi bounced along the rutted road, bracketed by the desolate Sinai High Mountain range to the West and the Red Sea to the East. I didn’t see Moses descending from the hills with the Commandments for his people, but I was fascinated by the native Bedouin tribe people, gathered in a small group under the sketchy shade of a makeshift shelter. Their camels rested in the sand, except for the one that I was currently preoccupied with photographing. 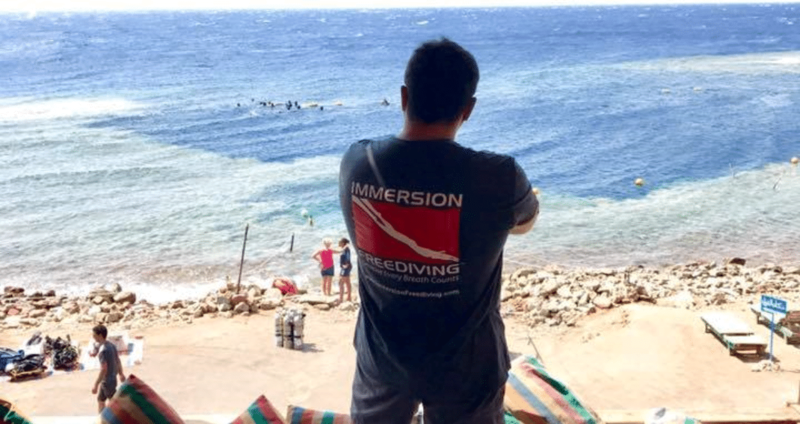 I was here on the Sinai Peninsula to do a little diving in the world-famous Blue Hole and maybe meet with some of the permanent resident free-divers who have established a growing presence in this remote corner of the world. Along with Sara, I hoped to grab a few minutes with Pim Vermeulen and Wendy Timmermans, who organize the RedCcup, and meet some of the competitors who would be flocking to this AIDA-sanctioned depth competition before the AIDA Freediving World Championship in Roatan August 22-September 3, 2017. Both Pim and Wendy are Dutch National Record Holders…and Pim is a seasoned Judge, Freediving Instructor, and Trainer, while Wendy is the Vice-World Champion in Constant No Fins (CNF). I also wanted to spend some time with the freediving family at Dahab Freedivers. Miguel Lozano and Pascal Berger are two of the great freedivers who founded Dahab Freedivers with Stephen Keenan, who tragically passed away last month while serving as the safety diver for a freediving attempt on the Arch. For many divers, the name Dahab immediately brings to mind the challenging and beautiful Blue Hole, the sheltered 94m/308ft submarine sinkhole that offers year-round calm conditions, good visibility and excellent depth for freediving training. Recreational divers are attracted to the plunging coral walls and abundant marine life. 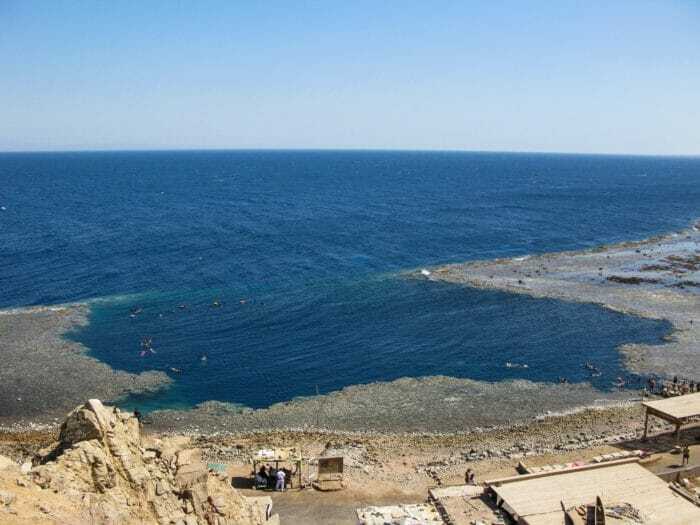 Actually situated a few kilometers north of Dahab, the Blue Hole has become a mecca for recreational and technical divers, as well as a major locus for the world’s freediving community as well. The “Arch“, a 26m/85ft long tunnel that penetrates the reef wall and leads from the Blue Hole to the open sea. At a depth of 56m/184ft, the Arch has also earned a sobering reputation for being exceptionally dangerous, with over a 130 reported deaths of scuba divers and snorkelers at the Blue Hole since its discovery in 1968. 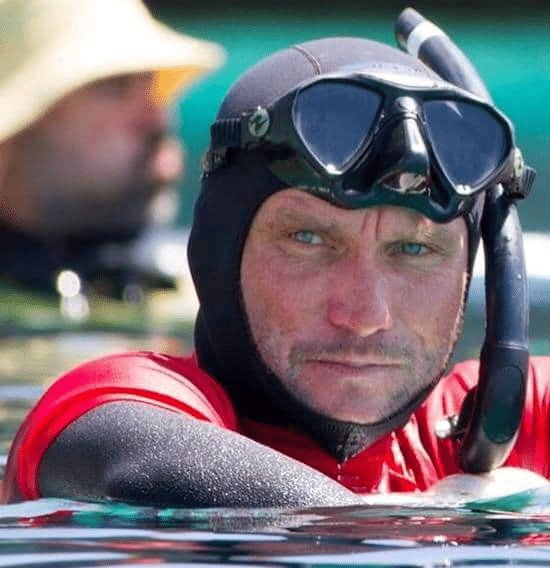 The recent tragic loss of Stephen Keenan was the first freediver fatality ever. The extreme depths of the Arch put it beyond the capabilities of recreational scuba divers. 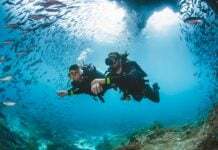 This great depth, strong current that can flow through the arch and the deceptive angles and downward slope of the passage, have all made this a challenging and difficult dive. While this is exactly what attracts Technical divers from around the world, for the rest of us, the massive coral reef wall and accessibility to shore has turned this tiny Bedouin fishing village into the epicenter of diving on the Red Sea. 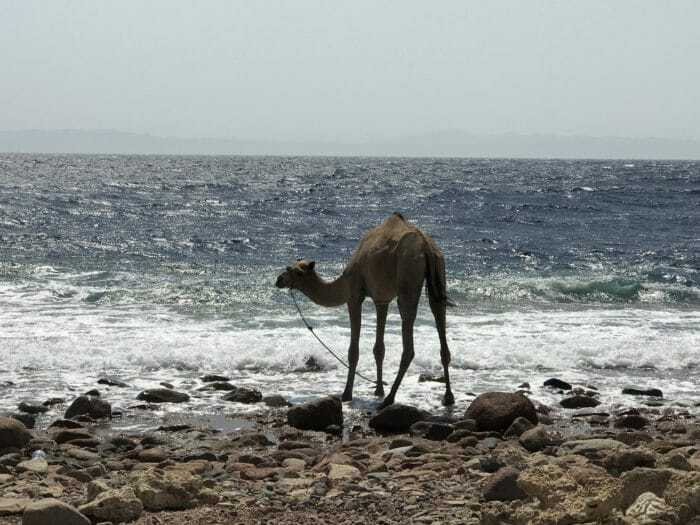 Contrasting with the burnt oranges and tans of the barren mountains that ring the village, the brilliant Blue waters of the Red Sea shine like the water is coated with diamond dust. The constant, light breeze blows across the water from Saudi Arabia, dimly visible on the horizon. The sheltering walls of the sinkhole protect the Blue Hole from the small waves that fill the sea over the saddle, where the wall plunges into the depths…varying from around 100m/328ft to over 1,000m/3,280ft along the reef’s seaward side. 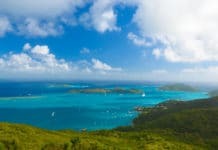 The narrow road that runs along the shore is faced with a handful of restaurants and small dive shops catering to the hundreds of divers and snorkelers who throng the rocky shore. To get to the water, one simply walks across the road and through one of the few roped off paths across the top of the reef. The three or four meters of walking across the rough and slick coral can be a challenge, and while Blue Hole is often tranquil, during peak hours (usually around 11 am to 2 pm) one has to maneuver through dozens of people. 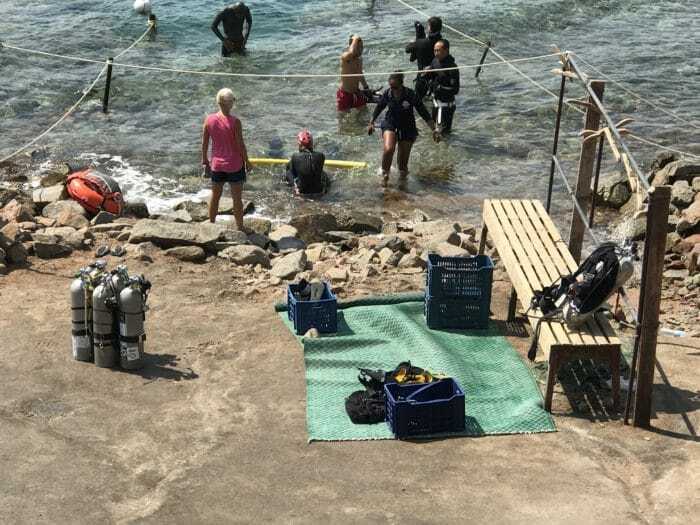 The limited access points quickly fill with tourists kitted up in snorkeling vests and awkwardly holding their rental equipment, scuba divers being ushered by their dive-masters, to technical divers lugging side-mount cylinders and wings with doubles…all trying to exit and enter the waters simultaneously. Interspersed through the crowd, I could see competitive freedivers, who moved through the crowd like a school of Barracuda, sleek competition wetsuits, long fins casually held in practiced hands. 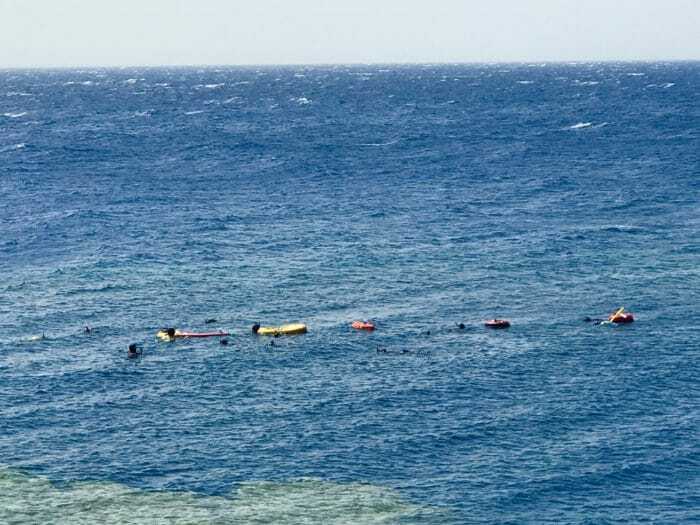 For them, the elite freedivers who come to Dahab to train for depth and compete in one for the last sanctioned competitions before the World Freediving Championship, the crowds magically part. For me, the fat guy without a wetsuit and no fins, the struggle was real. Once we got across the road and through the throngs, Sara and Ashley Parkinson, who works with Discover Your Depths Freediving and Yoga literally plunge right in..the cool, clear and Blue depths immediately accessible just meters from the road. Below me, I can see scuba divers queued up to exit their dives, people of all ages splashing around, getting their kit sorted for their snorkel tour…and the brilliant colors of the reef fish that darted among the sea of legs and divers…an intricate ballet of colors set against a brilliant, Blue backdrop. I had come here at the tail-end of a long business trip, hoping to recharge my soul battery and maybe watch a little of the competition. I was honored and humbled to be invited to dive as a competitor, slotted in the mid-morning break. As a duly-registered competitor with my National Body, I qualified to dive…but I had never dived in a depth competition…thankfully Sara came to the rescue. We gathered on one of the practice floats that streamed from left to right across the competition area. Sara worked with me on my entry and how to stretch for maximum effect on the line. Breathing up o the surface, the line drawn taught under my hand, I practiced slow, steady descents…it had been decided that since I didn’t come with a) a lanyard, b) a wetsuit, c) fins, d) experience…Free Immersion (FIM) would be the most sensible depth discipline for me to execute. Feeling good about my equalization and comfortable in the water, I moved to the competition float, where I met the judges and the safeties and went over surface protocols one more time. I clipped the borrowed lanyard to the line, the pull against my ankle a gentle reminder that this was real. I could hear the voice behind me say “4 minutes” and I started my breath-up, slowly tuning out distractions and focusing on slowing down everything. As the countdown approached Official Top, I took a deep breath and then it was time to dive. As I turned into my hand, putting myself upside down, facing the line, I let myself relax…stretching into the next pull and equalizing as my hand passed my nose..slow and steady rhythm. My eyes were closed, but I could feel the sensations of the cool water rushing over me, the faint noises from all the divers echoing through the water. As I neared the plate, I opened my eyes to see safety divers on either side and the fluttering, white Velcro tabs waving in the soft current. “Grab the tag” was my mantra and, with the last pull, I arrived at the plate, completed my turn and headed for the surface. This was not the deepest dive I’ve ever done by any means…but it was my first dive with a dozen or more strangers watching. Fat, out of shape and without the uniform of the elite athlete..my trusty swimming trunks and my $20 mask marked me as an interloper, an outsider into this magical family of freedivers. Giving high-fives to everyone in reach and smiling like a fool, I enjoyed the splashing and congratulations…my small, insignificant 15m FIM dive took on a whole different meaning to me.  I had descended an outsider…I had surfaced a part of the freediving family. The RedCcup competition is hosted by two permanent residents of Dahab, Pim Vermeulen, and Wendy Timmermans. Both are of Dutch origin and are experienced AIDA Instructor Trainers, Judges, and athletes. The competition takes place under auspices of the Dutch Freedive Association (DFA). Both Pim and Wendy are powerhouses; working feverishly to make this event a successful and safe place for the world’s best freedivers to come and compete. The RedCcup is also a great place for novices to gain experience, pick up tips from National and World-record holders and gain the seasoning for the bigger comps and challenges ahead. This RedCcup was the eighth one held since their start in 2015. 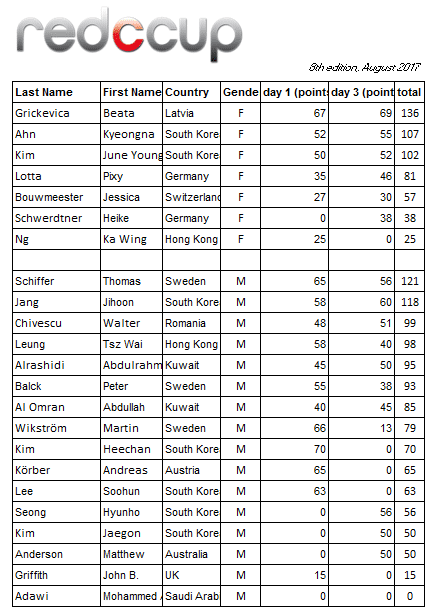 Twenty-seven athletes (and one journalist) from 13 countries participated. A strong contingent from South Korea made their presence know and the competition saw strong performances in Constant Weight (CWT), Free Immersion (FIM), Constant No Fins (CNF) and Static (STA) with 12 new National Records set. Three days of amazing dives, no injuries and only one BO…the competition were hailed by all the participants as an absolute success. The competition came to a close with awards and a great Vegan dinner prepared by Sheila Hanney at Marine Garden in Dahab…proceeds went to support Sea Shepherd Conservation Society (SSCS) and a final toast was raised to honor and remember freediving legend and Dahab family member Stephen Keenan. Competitions never happen without sponsors and I ‘d be remiss if I didn’t mention that the sponsors included Octopus Freediving gear by Pascal Berger, Discover Your Depths Yoga and Freediving by Sara Campbell and Sheila Hanney at Marine Garden. The next RedCcup will be held October 24-26th, 2017…reserve your spot now! Happy to been diving the arch so many years ago … nobody around this place!